We looked at a good bit of corn this week that is now coming up in a few different stages. This field was actually planted before our freeze two week back. It slowed germination but would not have any injury. 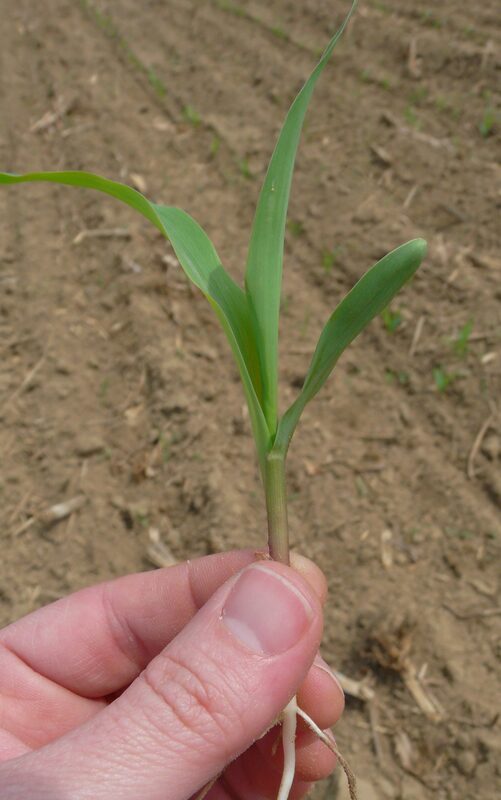 Any corn with just a few leaves – in the V1 growth stage – still has the groing point below the soil surface, which protects the plants from freeze. We’re just now getting our first herbicide shot, so we’re able to mix Prowl in for grass control. Buffalo grass is all througought this field. 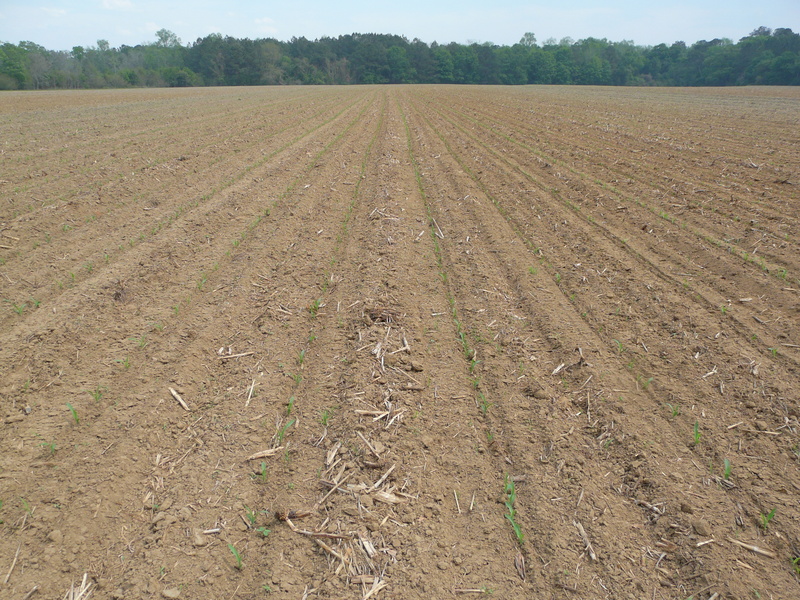 Since some grass has already emerged, UGA Weed Scientist Dr. Eric Prostko says it’s okay to add Round Up in with Atrazine + Prowl. It’s one of the best one-shots we have in corn. We had just enough rain last night to help activiate some pre-emergent herbicides. V1 Growth Stage – The collar (white line) is present on the 1st leaf. V2 Growth Stage – The collar is present on 1st and 2nd leaf. At the V1 growth stage, the growing point is still below the surface of the soil. At this stage, three leaves are visible. The leaf collar is only on the lowest leaf. At V2, four leaves are visible, but the collar is only on the 1st and 2nd leaf. 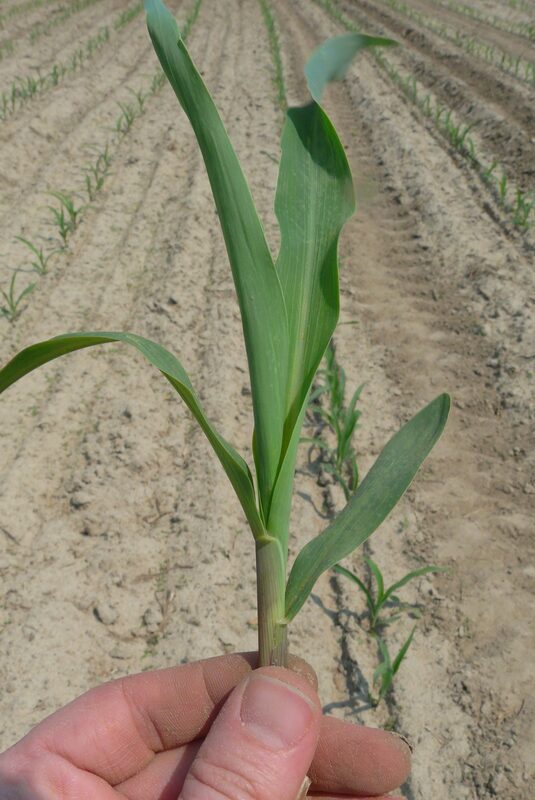 At this growth stage, corn water demand is close to 1/10″ a day.